Swim caps don’t have to be boring. Swim caps are an essential element when it comes to swimming well. The goal in swimming is to make your body as hydrodynamic as possible, which often means covering up any hair on your body if possible. This is the primary reason why swimmers need to wear swim caps. However, this doesn’t mean you have to wear a boring plain swim cap, especially when you are in the pool for practice every day. Instead, you can try these fun new swim caps to make things more interesting for yourself and everyone else in the pool. This incredibly colorful silicone swim cap is an excellent way to stand out from the other swimmers in the pool. The I Heart Swim cap is primarily blue, but it offers an incredible splash of bright colors to make the cap even more fun. The cap shows hands held in the shape of a heart with the word “Swim” written inside the heart shape. 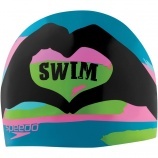 What a great way to show your love of swimming and enjoy a fun cap at the same time. Mustaches can be a lot of fun, but they aren’t something that is suitable for competitive swimming. The hair can really slow you down. But this doesn’t mean you have to leave your love of mustaches behind. Instead, you can wear this fun mustache swim cap that features a print pattern of mustaches in many colors. Not to mention you will really stand out in the crowd when you sport this fun cap on your head. Some people prefer to use a plain swim cap because they don’t want to stand out or are more serious about the sport. However, this doesn’t mean you have to restrict yourself to boring. You can add some fun to your practices with a wide variety of fun swim caps. Some of the fun options swimmers can enjoy include a list of swim excuses, a luchadore mask, “we swim in peace” alien, fun faces, pumpkins and even chilling penguins. The options are practically endless. Swim caps are a necessity to improve the way you swim through the water. While you may be restricted to plain caps during competitions, there’s no reason to keep a few fun swim caps on hand so you can have fun in the pool during your practices and stand apart from the other swimmers. You can customize swim team caps for your entire team. When you consider your swim team’s apparel, the swim caps they wear should be considered. Not only is it a good way to ensure everyone is wearing a quality cap, it also gives your team a uniform look, especially when you purchase custom swim caps with your team’s name or logo on it. Swim team caps are meant to reduce the amount of drag swimmers experience to speed up their times. As an added benefit, it also helps protect their hair from chlorine and other chemicals in the pool. It is essential for every member of your team to wear a cap, especially during competition. Choose those that will offer your team a uniform look and intimidate your opposing teams. Swim team latex caps are the thinner of the swim cap choices. Many swimmers prefer the thinner material, making them feel less weighed down in the water. Because they are thinner than other caps, they do retain less heat, enabling your swimmers to feel more comfortable overall. It is important to understand they are less durable than the silicone option. As long as your team is aware that proper care is necessary, it could last for a long time. 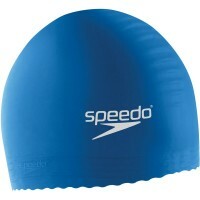 If your swim team is on a budget, custom latex caps are a good choice because they offer affordable yet durable protection. Team silicone caps offer the most durability out of any swim team caps available. If your team takes proper care of their caps, they can last for many years. Not only are they durable, they also offer a more stable position on the head with little slipping. This makes it a more comfortable choice for many swimmers. The type of team swim caps you choose will determine the type of customization you can get. The printed swim caps are typically available in a large number of colors, enabling you to choose the color that matches your team’s color. In addition, you can have your team name or logo imprinted on the caps in a variety of colors. The silicone caps have more versatility when it comes to customizations, but either type of custom swim caps offer protection and team spirit all in one product. Finding the best swim caps will enhance your performance. Anyone who swims competitively knows you need to wear a swim cap for a variety of reasons. However, when it comes to the best swim caps, you will have many to choose from, allowing you to find the right one for your needs. There is no right swim cap for everyone. Instead, it is up to each individual swimmer to seek out the one that works the best for him or her. All swim caps will provide the same streamlining. It is the other options you need to consider. One of the first things you need to consider as you choose the best swim cap is to understand the purposes of the swim cap. When you know what it is supposed to do, you will be able to find the one that works best for you. In general, your swim cap is meant to keep your hair out of the water to reduce the resistance. However, your swim cap will also protect your hair from the chlorine and keep hair from clogging the pool drains. Some swimmers even use an extra swim cap to keep their goggles in place. As you consider the best swim caps on the market, the most important thing is to choose one that has the best fit for you. While swim caps are generally the same, some fit in different ways depending on several factors. For instance, if you have longer hair, you will need a swim cap designed to accommodate more hair so you can have the same advantages as someone with short hair. Though not as important as the fit and functionality of your swim cap, the best swim caps can have any look you want for them. Some companies will allow you to choose the best swim cap for you and then customize it. Whether you want to choose a color that will match your suit or you want your team logo on the side, a customized swim cap is a great option to give your whole team a uniform look. Finding the best swim caps will help you make the most of your swimming skills. As you select the right swim cap for you, it will be important for you to understand its purpose so you can choose the one that has the best fit and the customized look you want. Your swim cap needs to make an impact in the water, as well as provide you with the coverage you want as you swim. Lucky charms are nothing new in fact many swimmers swear by them. Back in my swimming days I would not be able to race in a new pair of goggles until I had successfully chewed on both ends of the goggle straps. Maybe this is more of a bad habit vs a good luck charm. But there are many swimmers that do have there lucky swimsuit, cap, or goggles. Now a days the swim caps already come with the good luck. The shamrocks on this lucky swim cap will be sure to give you at least a little bit of good luck for your swim race. D&J Sports Swim Shop is having a sale on their silicone swim caps this week. Just in time to get your loved one a fun swim cap for Valentine’s Day. The silicone swim caps are the best caps available. They can last for months and are much easier to get on your head than the latex swim caps. Plus they do not fade or turn brown when exposed to the pool chemicals. D&J Sports has many fun printed silicone swim caps and also some solid silicone swim caps too. Be sure to place your order online before Sunday and save 25% off the silicone swim caps.